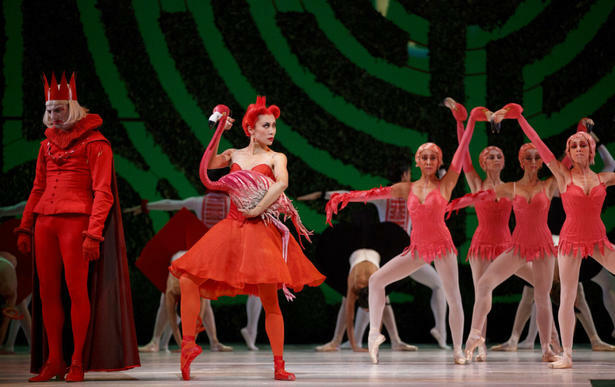 Using a deft combination of technical wizardry and tour-de-force dancing, Alice’s Adventures in Wonderland is a joy of a ballet. Sticking fairly close to the original story, librettist Nicholas Wright and choreographer Christopher Wheeldon have made a few changes to help translate the book into a grand story ballet. The action in Wonderland is framed by the grounds of Oxford University. Alice’s father, the Dean of Christ Church College, is hosting a garden party with a multitude of wondrous guests, including a Rajah and his wives, a duchess and her baby, a vicar and a verger, and the mathematics lecturer Lewis Carroll, who entertains Dean Lidell’s three daughters with stories and magic tricks. Alice, in her mid to late teens, is a bit older in this version than the original. The change allows for an Alice who is still girlish, still figuring things out, but also the right age to discover her first love in the young gardener Jack (who in Wonderland becomes the Knave of Hearts). Jillian Vanstone and Zdenek Konvalina. Photo: Bruce Zinger. The Alice role is a delightful and demanding one: she’s onstage almost constantly. Like Clara in The Nutcracker and Juliet in Romeo and Juliet, Alice must be danced in a way that shows an immature girl blossoming into a young woman. She needs to be capable of a convincing temper tantrum, of delight at new sights and ideas, and of tenderness as she discovers her love for Jack/The Knave. 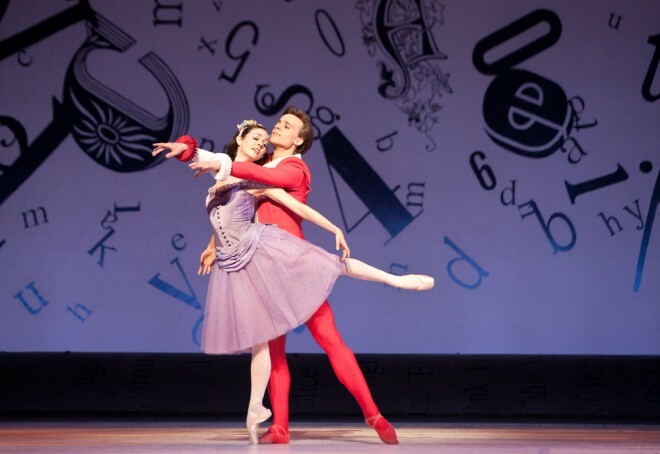 The other characters all have dual roles to play, too, as Wheeldon and Wright have created the Wonderland cast as echoes of people in Alice’s real world: the Rajah at the party becomes the Caterpillar, Lewis Carroll the White Rabbit, Alice’s parents the King and Queen of Hearts and so on. This at once highlights the dreaminess and the absurdity of Wonderland. Elena Lobsanova and Xiao Nan Yu. Photo: Bruce Zinger. Charles Wheeldon’s playful choreography and Joby Talbot’s melodic, majestic score capture the very essence of Alice. Bringing the ballet to splashy, colourful life are the sets, lighting, costumes and make-up. Each Wonderland character is fresh and yet immediately identifiable. The Queen of Hearts’ gigantic dress, which requires several attendants to help her move about, is particularly stunning, as are the female playing cards, whose tutus are actually diamonds, hearts, spades, and clubs. Sets combine lush visuals with a bit of mischief, for example the home of the Duchess, which appears as a large “Home, Sweet Home” cross-stitched sampler. 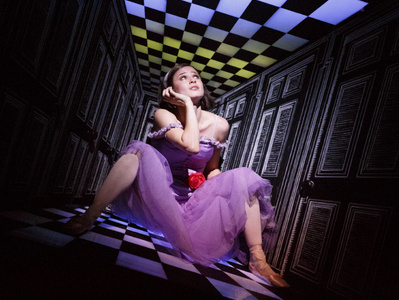 Projection is used cunningly as well to portray Alice’s fall down the rabbit-hole and her problems with growing and shrinking. 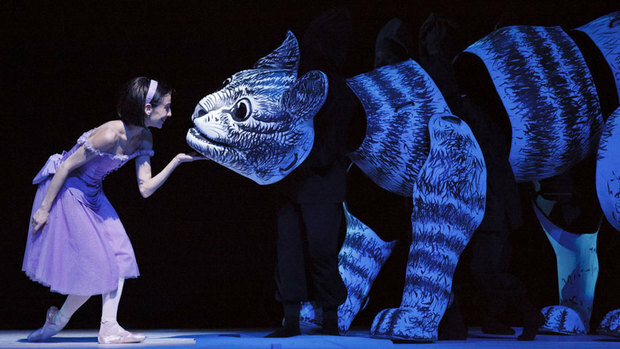 The Cheshire Cat, a grinning behemoth who is worked by eight dancers in black suits who each move a different piece of the cat, is a showstopper, receiving applause each time he took the stage. Sonia Rodriguez as Alice, with the Chesire Cat. Photo: Bruce Zinger. The choreography is at once an homage and a gentle wink at great classics of story ballet. Jack and Alice’s pas de deux recalls Swan Lake, while the Queen of Hearts’ brilliantly comic dance with her playing card subjects, who quiver in terror and push each other toward partnering her (and more than once dropping her) is just brilliant. Casting the Mad Hatter as a Mad Tap Dancer is inspired, as are the young dancers as the flamingoes and hedgehogs in the game of croquet. Kevin D. Bowles and Xiao Nan Yu. Photo: Bruce Zinger. I praise the retooling that’s been done as well. The mounting of Alice’s Adventures in the 2010–2011 season was excellent, to be sure, but its pacing was off and storyline somewhat convoluted. In breaking the ballet into three acts instead of two, Wheeldon and his team have the chance to create larger, longer dances that give each character and setting a chance to shine. The role of Jack/the Knave has been developed and drawn into the first act of the ballet far more, as well, making him a plausible romantic interest for Alice that we really care about. The synergy of its brilliant dancers, expressive choreography, and innovative sets and costumes, makes for consummate storytelling and dancing. In short, this is the definitive Alice for the stage. The Cheshire Cat was my favourite character – and I’m not just saying that because I love cats. At first I didn’t “get it”: why separate him into that many parts? Wouldn’t four dancers have sufficed (one for the head, one each for the front and hind legs, and one for the tail)? But the way he moved… was moved around… was just perfect with eight dancers. It wasn’t just absurd, it was ABSURD, and awesome, and therefore wonderfully appropriate for the Alice story. I would gladly watch it again, right now. And then again tomorrow. What a feast for the eyes. Also, may I please have my very own gigantic heart dress and attendants? YES. Because I want a gigantic heart dress too. Also minions. It’s always a good sign when a ballet makes you want to go back and see it again. This one is such a winner, and it’s great to see that story ballet can be invented anew without feeling like a rehash of the classics.